When you are a self-publisher, it's not enough to write, edit, illustrate and produce a book. You want your book to reach readers. And that means marketing and promotion. When you produce an anthology, you tap into an entire "village" of creativity. Which is what happened yesterday as we celebrated our achievement of collaborating, writing and producing an anthology of original, never-before published stories and poems by 15 authors. Our special "guest of honor" at this party was Slants of Light, our beautiful book lovingly crafted with heart, soul, talent and tenacity, which we offer to you, our readers. Watch out world when you put a group of women around a "kitchen table" - or a circular glass table on a beautiful outdoor patio - and let them brainstorm and unleash their ideas and energy! It's amazing. Each of us brought to "the table" our ideas for marketing and promoting our book. We wanted to share those initiatives with all of you up-and-coming authors and self-publishers. Meeting with independent bookstore owners and pitching the book on consignment coupled with an author signing. Contacting college and university alumni offices which run the gamut from the University of Delaware, the University of Pennsylvania . . . and on . . . and suggesting to former professors that the book be considered for women's studies curriculum as well as alumni magazine features. Contact the local Women's Resource Center and women's referral networks in the Philadelphia area. Write a blog post for Patch (online community newspaper owned by AOL which offers opportunities to write on topics of interest to the community). Schedule programs and panel discussions at local libraries featuring women writers talking about writing, self-publishing and social media - (two programs scheduled). Contact book clubs and ask friends to host a book party. Contact hospital gift shops to sell the book and offer a book signing. Contact nursing homes and assisted living communities to do readings and talk about writing, poetry and memoir. Contact hairdressers and chiropractors, (just to name two), by asking them to purchase the book and place it in their offices/shops. Ask friends to buy the book and when they agree, immediately put a copy in an envelope and mail off so they have it to show others. Contact townships about a table at their community fair days. 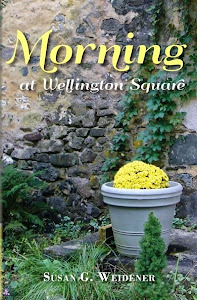 Contact churches about offering the book at craft fairs or for discussion groups. Schedule book signings at the local coffeehouse (already scheduled). Send out press releases and invite press to author signing and reception and propose they write a feature story on the anthology by making authors available for interviews and photos. 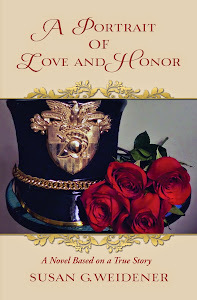 Partake in book signings in other states offered by friends and family. Feature the anthology in the local business school's monthly flyer (accomplished). Speak to patients in the rehab units of two local hospitals about the healing journey of writing (in progress). Promote through a magazine cover story (accomplished). Schedule a giveaway on Goodreads (accomplished). Place the book in a convenience store adjacent to one of the busiest gas stations on the New Jersey Shore (accomplished). And, this, dear readers, is what we have come up with in just two weeks! Although creating the anthology felt at times like Sisyphus pushing the proverbial "boulder" up the hill, at the end of the day a group of cheering women waited at the top (see the watercolor presented to me by Diane). All of us who author and self-publish can - and must - cheer each other on. For what all of this comes down to is building relationships and connections with each other, in our communities and in the larger, world community. We would love to "brainstorm" with you, and ask that you leave your promotional ideas of what has worked - what hasn't - in the comment section. Many thanks from the authors of Slants of Light. Hello everyone! Thank you so much for the great pics! Especially the boulder picture, Diane and Susan; I felt like I was there. Am feeling a bit better about missing the gathering. You are all so cool. Dear Kathy, It was electrifying for me personally; especially when I heard the individual initiatives the women are forging to sell the book on their own. Coffee shop signings, book stores in North Carolina. Magic combined with empowerment equals saying goodbye to fear and the naysayers! With that, my thought is time for a retreat and get back to the writing. Jan, You and Flo were there with us in spirit, our "sisters" in the Writing Circle. We love you and will see you soon. Our electrifying brainstorming luncheon was excellent. It made me smile inside and out. In my opinion life is about who we meet, why we meet and what happens when we meet. I'm blessed to have met you and the women of the WWC. Together we are making a difference. Our collective voice is a powerful gift. I'm so psyched that we're finally able to share our stories with the world. When this group of women gets together, great things happen! I'm excited sitting all the way out here in Portland, OR. The air between here and there is humming with the energy. Good luck in all your endeavors, and my best to you, Susan, and the Women's Writing Circle. .....I spent a large portion of my day yesterday at a once-a-year luncheon with a small group (about 40) of high school girlfriends. A few copies of "Slants of Light..." were placed strategically; all but two sold. 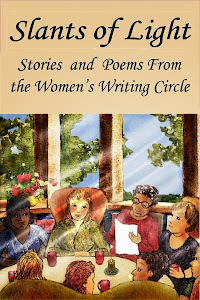 Some wanted to know all about 'what is a women's writing circle?' Some were incredulous that we not only wrote but also published a collaborative effort. I have a new set of e-mails to which I can/will send links and add'l info - for further sharing with daughters and granddaughters. It was a WONDERful day, ladies. Onward to Saturday at the Book Barn! I am thrilled by all I am reading here - the teamwork and the collaboration and now the joy of presenting a beautiful and unique self-published book to our readers. Candice, you sum it up: "Our collective voice is a powerful gift." Sherrey, Thank you for visiting the Circle all the way from Portland. 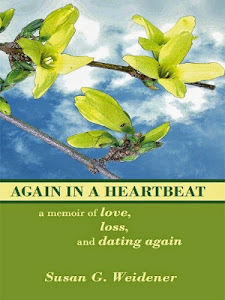 You know I am a huge fan of all you are doing in the memoir community and writing as a way of healing. "Humming with energy ..." Yes, indeed!